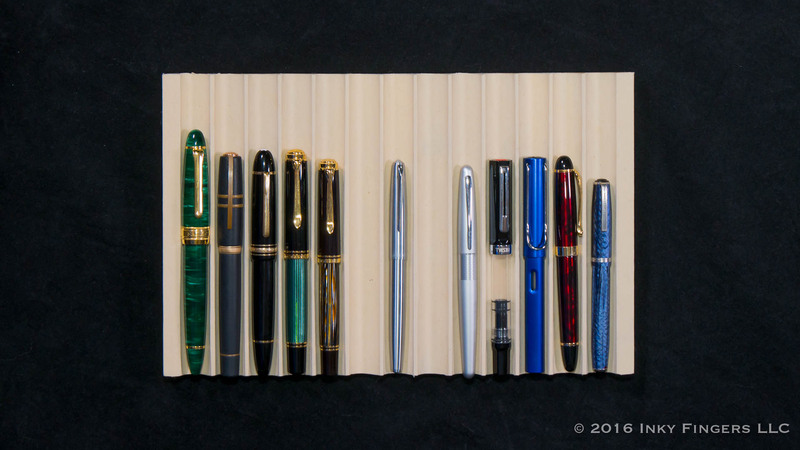 In the pen world, there is a very fine line between a design that is “inspired by” the designs of other pens and those that are clearly meant to serve as an outright copy of a design. There are, after all, only so many differences you can inject into an object as ostensibly simple as a fountain pen before you turn it into something else altogether. Chinese manufacturer, Hero, is a long-lived, prolific, and generally well-regarded manufacturer of fountain pens. As a brand, however, they are fairly well-known for skating (or sometimes long-jumping over) this line. This can be seen with the previously reviewed Hero 9315, with which Hero appropriated the shape and pattern of a Parker Sonnet, including going to far as to duplicate Parker’s trademark arrow-shaped clip. 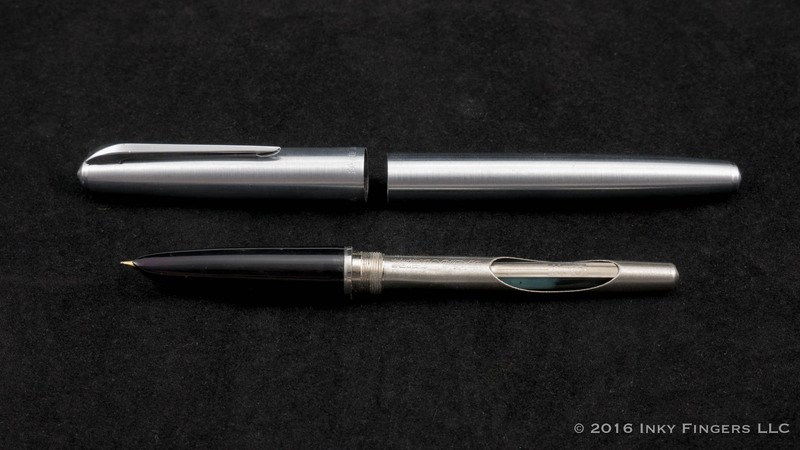 The Hero 100 Classic Series fountain pen is another example of them “borrowing” design inspiration; although in this case, they appear to have stayed on the “inspired by” side of the line. 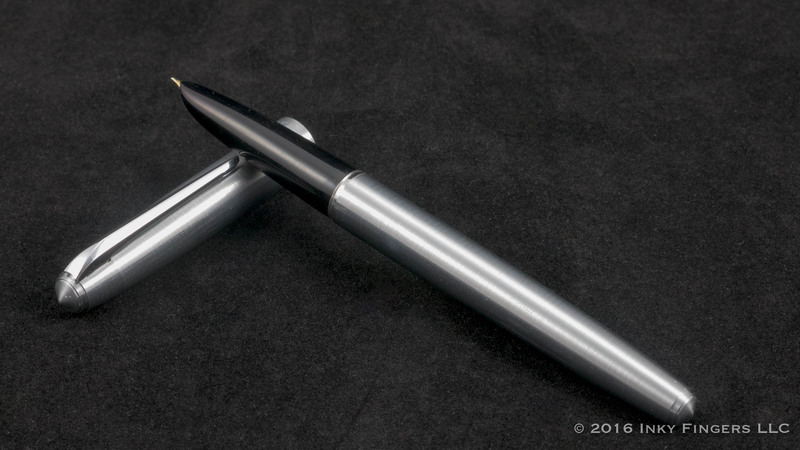 The Hero 100 is remarkably similar to one of the most popular fountain pens of all time, the venerable Parker 51. However, instead of a straight-up copy, they do make some adjustments to the design to give the Hero 100 its own look and feel. Due to these small differences, and the fact that the Parker 51 on which it is based is no longer in production, makes the Hero 100 feel much less derivative. Made entirely of a brushed steel, the Hero 100 is topped by a faux “jewel” which has been machined into the seamless material of the cap. Hero avoids copying the Parker arrow clip this time, opting instead for a chrome-colored metal clip with a slim, streamlined profile. This hinged clip is both attractive and rather solid. 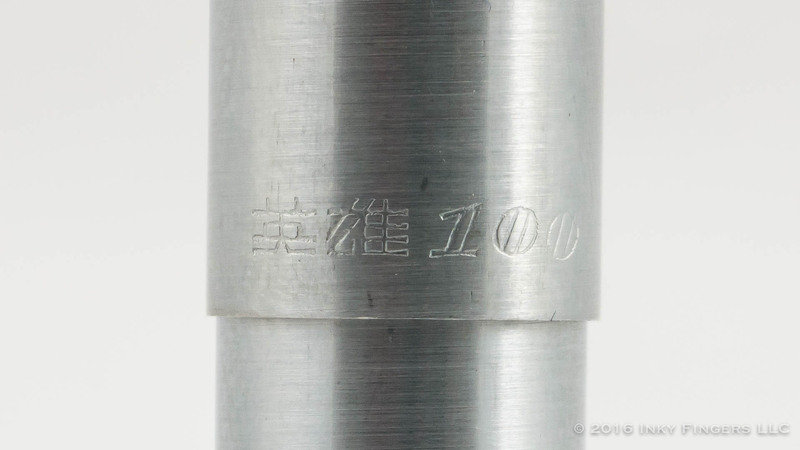 The cap flares out slightly and ends in a thin edge onto which are engraved some Chinese characters (one assumes this is the brand’s name) and the number 100. On the back side are the English words “Made in China”. 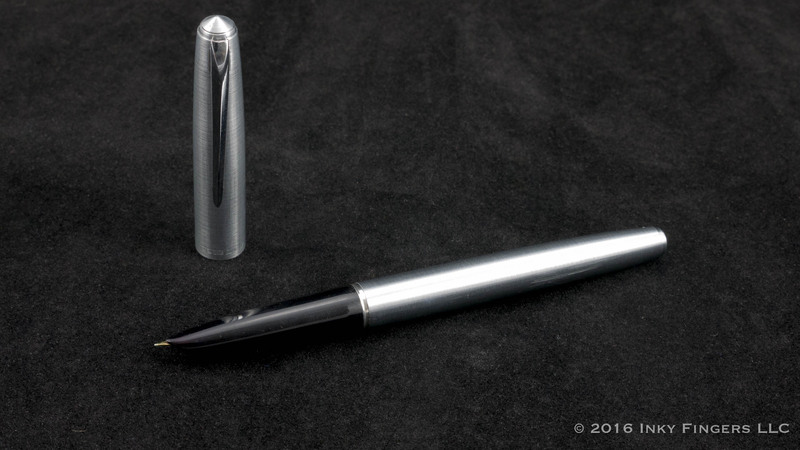 The rest of the barrel is without any additional decoration save for another machined faux jewel at the end of the pen. The pull-off cap is friction-fit and feels nicely secure. When removed, it reveals a black plastic section that is an exact copy of the Parker’s section. The section flows smoothly into the barrel without threads or a step-down, allowing for a comfortable grip regardless of how you like to hold your pen. 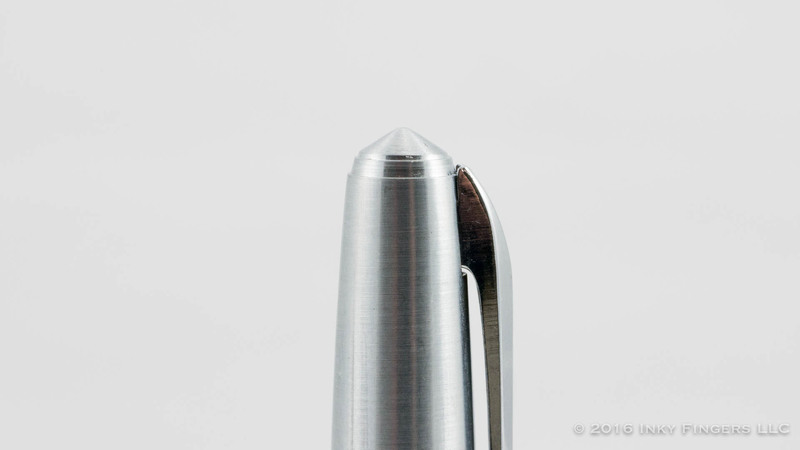 The section then tapers down to a narrow point which hoods all but a tiny, exposed point of a nib. 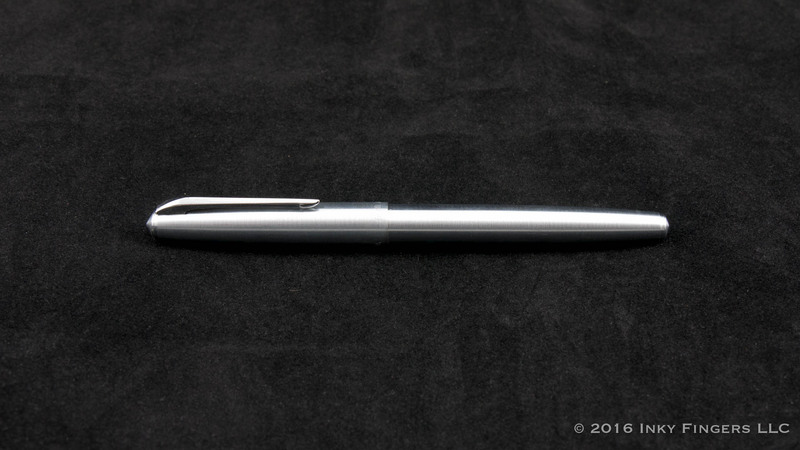 (I consider this a fountain pen for people who want to trick everyone else into thinking they’re using a ballpoint pen.) 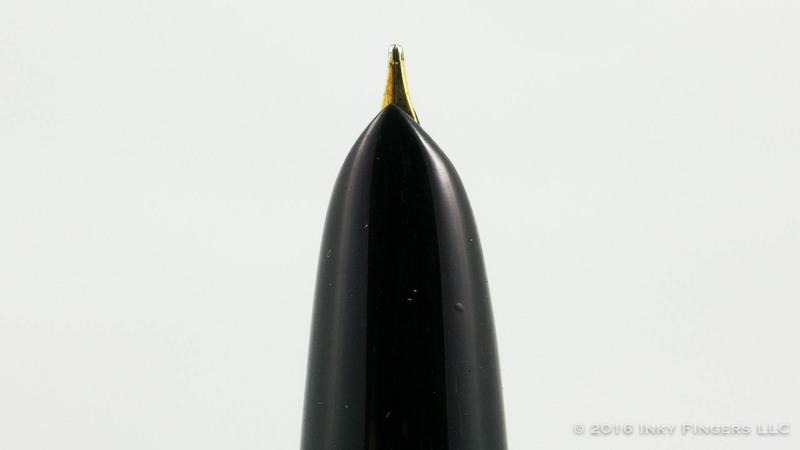 The nib itself is said to be made of 14k gold, but there are no visible hallmarks on the hooded nib, so it’s hard to know for sure. There is not an easy way to remove the nib from the section as the pen’s various pieces have been glued together. The barrel unscrews from the section and reveals a large, integrated aerometric-style filling system which, again, is firmly attached and cannot be easily removed. 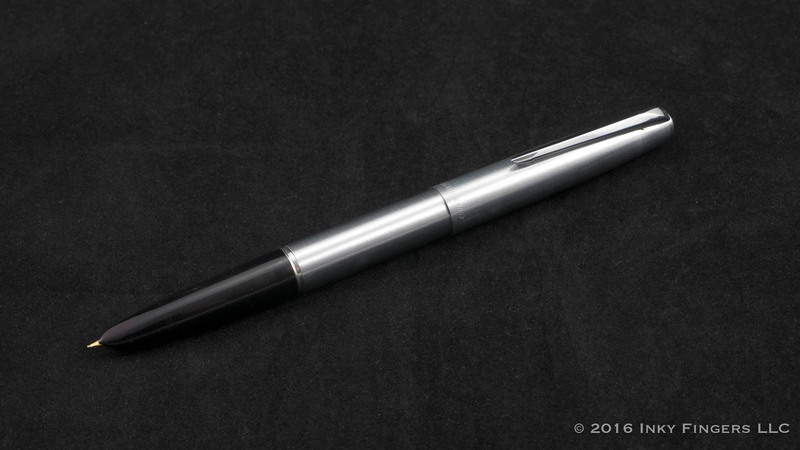 (It would have been nice if, while they were tweaking the design of the Parker 51, they had “improved” the pen to include a standard international cartridge and converter, but alas, they stuck with the aerometric filler.) The filling system consists of a metal sleeve inside which is attached a clear silicone sac. The sac is compressed by pressing down on a small metal bar accessible through a hole in the wall of the converter. I rather loathe aerometric fillers, and this one is particularly poor. Depressing the pressure bar several times only ever gets the sac to half full. Ink tends to pool up toward the back of the sac, impeding ink flow to the nib. And with a non-removable aerometric converter, cleaning this pen is a right pain. It’s like someone took all the world’s filling systems, picked the worst characteristics of all of them, and combined them to make Aerometric fillers. The hooded fine nib on the Hero 100 that I reviewed is not a bad nib. It is smooth with a hint of nice feedback. It is well adjusted to a nice, moderate wetness. In the hand, the pen is comfortable and nicely balanced, whether posted or not. (I particularly like using this pen posted.) The hooded nib does tend to exacerbate my personal tendency to roll the pen as I write. Fortunately, the shape of the nib tip is such that the pen remains capable of writing even when I do roll the pen. I’m not entirely sure how they managed it, but this pen has a nice, wide sweet spot. As nice as the nib is, however, it is hindered nearly to the point of un-usability by the feed and/or converter. This particular pen has one of the worst cases of ink starvation syndrome I’ve ever seen in a pen. After half a page of writing, the ink flow would slow significantly, before stopping entirely. The aerometric style of converter also makes this pen particularly difficult to prime without spilling ink all over the place. In the end, I found myself having to whip the tip of the pen about to get ink to the tip of the pen and start it writing again. This wasn’t an issue when I was writing outside on my patio; inside, though, I had to wrap the pen in a cloth or paper towel before whipping it about like I was conducting Beethoven’s 5th. Only then could I get it writing again, which it would do for another half a page. The faster I wrote, the worse the problem became. This problem was particularly disheartening in light of how well the Parker 51 on which the Hero 100 is based, would write. It seems that one of the features they did not copy was the rock-solid feed system and ink flow. Regarding ink flow, the pen also had one other issue that I found particularly irksome: this thing dried out extremely quickly. 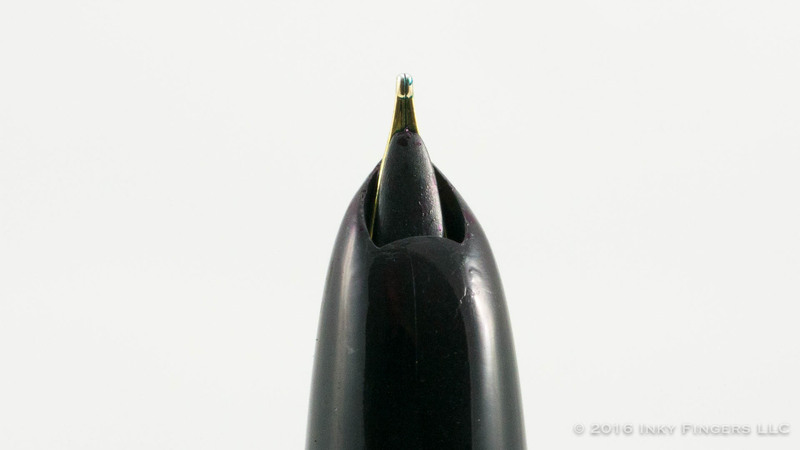 One of the points of a hooded nib is to expose less of the nib and feed to the air to allow the pen to stay wetter longer. However, if I let the pen stop writing uncapped for 30 seconds, the ink would stop flowing entirely. Even when I capped the pen, if I didn’t start writing again in 10-15 minutes, the nib would dry up and I found myself having to conduct Mussorgsky’s Night on Bald Mountain again before I could resume writing. I understand that fountain pen ink is water-based, and will dry out eventually, but the issue was so rapid and so persistent on the review model of the Hero 100 it made the pen difficult to use. Despite these problems, I did find this to be a decent pen to use as a knockabout pen. The metal body makes the pen feel solid, the cap and the clip were secure, and the pull-off cap and fine line of the nib meant that I could whip it out to use it for a quick note on lower-quality paper, or to check off items from my shopping list. For a couple of weeks, I was using it tucked into my Traveller’s Journal as I did my daily bullet point planning. Had it not been with the ink flow issues I experienced, this pen might have taken up a permanent place tucked into the leather of that notebook. 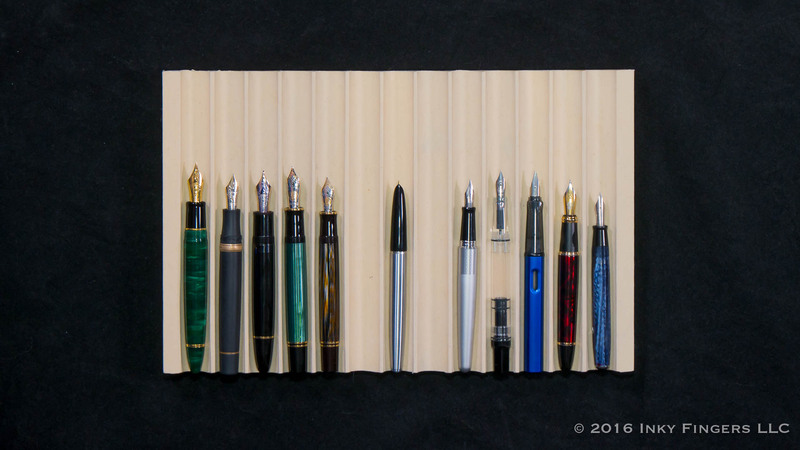 My experience with many of these low-cost “inspired by” pens is that one will be a great pen, while the next one coming off the assembly line will barely function. (Removing any sort of serious quality control process is a great way to lower production costs.) 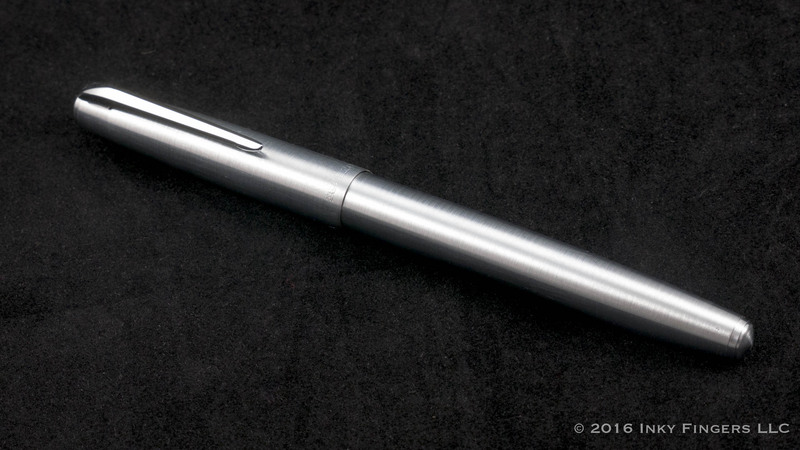 I, for instance, really liked my Hero 9315 I reviewed—especially after replacing the #5-sized nib. So, while I can’t necessarily recommend the Hero 100 based upon my experience with the pen if you do decide to give it a try, there is a chance that what you’ll get is actually a very nice pen. Just be aware that there’s also a possibility it could come with some serious issues. 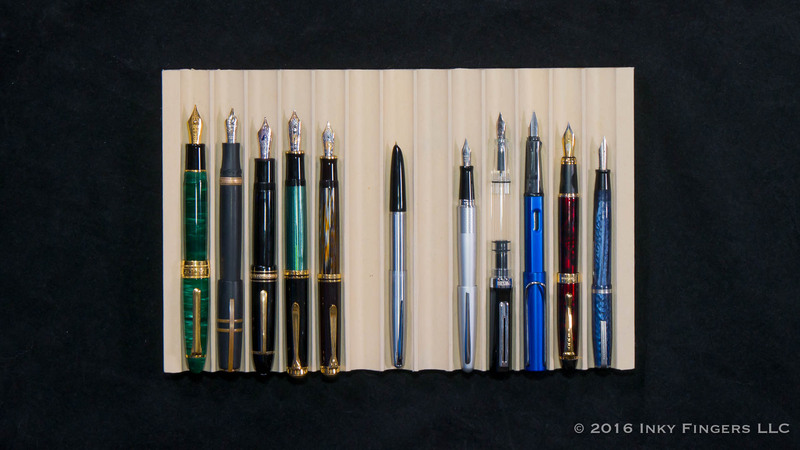 The pen for this review was provided free of charge by a Pen Habit viewer. No additional compensation was provided. All opinions expressed herein are my own.